On friday DHL delivered my new toys 🙂 Arduino-direct have expanded their shop with robotics, and is now offering the Rover 5 and the Dagu controller boards. I had tried to order the Rover 5 at several European shops but none could deliver one, they were all out of stock. So I ordered it from Arduino-direct in China, and DHL flew it to Belgium. Took less then a week to get here. 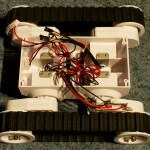 The Rover 5 is a nice platform to make a tracked or wheeled robot. 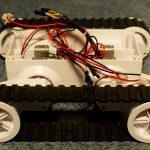 I bought the version with 4 motors and encoders. 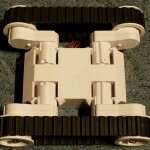 With the 4 motor version you can replace the tracks with normal wheels, I’ve seen a couple of videos of Rover 5’s with wheels from the Dagu Thumper fitted. The Rover 5 comes without any electronics fitted so you can choose how to control the motors. 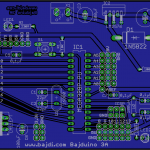 I went for the easy solution and bought the Dagu red back spider board and the 4 channel motor controller board. 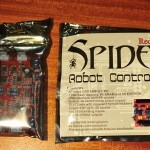 The red back spider is based on the Atmel ATMega 1280 and comes with the Arduino bootloader installed. 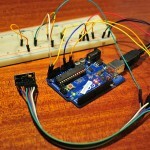 The 4 channel motor controller has support for the 4 encoders. The Rover 5 comes with a battery case for 6 AA batteries. But I’m thinking of replacing it with a Lipo battery. Easier to recharge then 6 AA’s. I will fit the Rover 5 with a nRF24L01 module so I can remote control it and 2 SRF06 ultrasonic sensors for collision detection. I’ll have to make some things myself, first thing will be a small print to supply the correct voltages to the different boards. I’ll need 3,3V for the nRF24L01 module and the accelerometer (if I decide to fit it) and 5V for the motor controller logic, but I could take that from the red back spider. 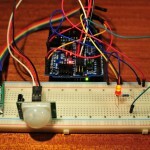 Which has a powerful LM2676 5V 3A voltage regulator. The reb back spider and motor controller board came with some stand-offs, but the Rover only has 4 holes to screw them in and they are to spaced to far from each other 🙁 So I’ve ordered some plexiglass and will use that to mount everything on. 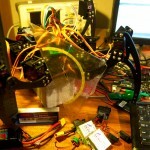 I’ve just wrote my first sketch to the red back spider to test the motors and got the motors to spin. I strongly recommend you take the tracks of when you first test it. I had to change the polarity of one connector to make all 4 of the motors spin in the same direction. 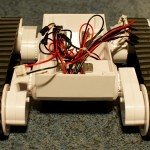 could you please show some diagrams or photos of how you have connected the rover with the control boards?